Howard Gordon Spalding intended to be an engineer but decided against it during college. Instead he became an educational administrator. By the time he retired in 1966, Spalding had been principal of four public high schools. His older brother by five years, John Ralph, also went into education; he became a high school teacher. Like Howard, Ralph – as he was known – graduated from the University of Vermont. The two overlapped because Ralph had served in the Great War. Left U.S. July 5, 1918, he wrote in a petition to replace his record of service, which had been lost. Served in France, St. Mihiel, September 12 to October 1, 1918; Meuse-Argonne October 10 to 14/15. Wounds received in service: left leg and hip Argonne Forest, October 14, 1918. So Ralph fought in the Meuse-Argonne Offensive, the most important American battle of World War I, led by General Pershing. American losses totaled 117,000. Howard, Ralph, and their sister Clara Bell were born in Warren, Vermont, and grew up knowing the woods and rolling hills around the north-flowing Mad River. Their father was a farmer who later owned a general store. The development of Sugarbush and other ski resorts occurred after World War II. Until then the beautiful valley was home to lumbering, farming, and maple sugar production. 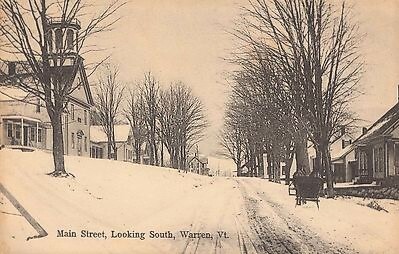 In November 1927, a devastating flood caused $30,000,000 worth of damage to central Vermont, including Warren. In one of the largest projects undertaken by the New Deal’s Civilian Conservation Corps, the state built the Wrightsville Dam to contain future floods. Most of the workers were World War I veterans who desperately needed jobs in the early 1930s. By that time, Clara Bell had married a Scottish minister nearly 20 years older than she, and both Ralph and Howard had left Vermont. The first place Howard landed was Cornwall-on-Hudson, N.Y., with his new wife, Lillian, also a University of Vermont graduate. He taught there for a few years before becoming principal of Ticonderoga High School (N.Y.) near Lake Champlain. At the end of the 1929 school year, the Kiwanis Club of Ticonderoga bid farewell to the man they called “Professor Spalding.” Howard was off to New York City to finish his master’s degree at Teachers College of Columbia University. Next, he and his family moved to the Panama Canal Zone where he worked as principal of the Balboa High School. At first it surprised me that he took the position, but then I saw that Balboa’s students were overwhelmingly American; the children of engineers, doctors, lawyers, and bankers representing nearly every state. And if Principal Spalding would have the opportunity to Americanize a few Panamanians, well then so much the better. Mr. Spalding . . . . . Not on the war path. While Howard laid down the law at Balboa, his brother Ralph taught social sciences at a Connecticut high school. He married a woman named Annie Todd, whom he met at the University of Vermont. Annie has an interesting little story. She had attended college for just one year before boarding a boat to Puerto Rico to work as a teacher under the auspices of a Congregational missionary organization. She went back and forth for three years, and published at least one article about her work at the Blanche Kellogg Institute in Santurce. A girls’ boarding school for grades 8-12, it offered training in housework “from the making of nine loaves of excellent bread each day to sweeping and cleaning of all kinds,” a report stated. The students also studied English, history, and Bible. It looks like Annie never taught again. Howard returned from the Zone in the mid-thirties. After the war ended, the superintendent of schools in Mt. Vernon, N.Y., hired him as a high school principal. Howard spent the rest of his career there, trying to maintain authority while social and cultural change swirled around him. He struggled to be nice. That’s what people told me. I admire how Howard and Ralph set sail on the sea of American opportunity. The brothers probably never felt the tug to return to the small town where they grew up. Because it was always 1900 in the farmhouse on South Hollow Road, with Ralph underfoot and Clara Bell trying to read the Bible, and two grandmothers named Mary and Augusta telling the farmer’s wife to relax because Howard could be born any moment now. My grandfather was born and raised in St. Albans, Vermont, worked an an engineer in Central America for many years -- they may have easily crossed paths. I agree, especially since the world was so much smaller then.